Eaton Corporation is proud to say that it follows ethical principles singled out as a priority in its way of doing business and keeping relationships with employees and external partners. However it is not this attitude that the Paraíba Valley population (Sao Paulo, Brazil) watched on September 29th, 2015, when Eaton convened the military police to crack down on the workers and end the strike unleashed by the Salary Campaign. Eaton plant in São José dos Campos produces valves for the Brazilian, American and European automotive industry, and has around 400 employees. It has among its customers the major automakers in the world. The unit is part of the multinational giant Eaton, of the power management sector, with customers in 175 countries and about 100,000 employees worldwide. In this report prepared by the Metalworkers Union of São José dos Campos and Region, affiliated to the CSP-Conlutas, it becomes evident that a relevant part of the Code of Ethics of the very Eaton is not being fulfilled. Carefully read and find out that, actually, the speech is not put into practice. Advocated principles, but not complied with by Eaton. The Eaton code of ethics says : "We respect and obey the laws, rules and regulations applicable to our businesses around the world". Workers went on strike on September 29th 2015 to put pressure on auto parts companies to review their pay rise proposal which was below the inflation rate. In an attempt to prevent the stoppage, Eaton convened the Military Police (PM) to crack down on workers and trade union leaders. At a given time, seventeen police cars and ten motorcycles remained in front of the plant, where the worker’ meeting was taking place. Even a military police helicopter flew over the plant during the operation. Policemen with firearms and truncheons snatched the banners and flags held high by the Trade Union threw pepper spray and physically assaulted activists and trade unionists. The Trade Union president, Antonio Ferreira de Barros, Macapa, was assaulted by a police officer. An attitude that leads us back to the hardest years of the military dictatorship. The gravity of the facts led the Metalworkers Union to forward the complaint to the Secretary of Public Security of the State of São Paulo, Alexandre de Moraes, requiring that the Military Police Corporation were warned lest repeated the crackdown on the trade union movement and workers. The repression against trade union organization did not end on 29 September. On the 15th of October, that is, two weeks after the strike, Eaton opened up a procedure for "evaluation of severe transgression" against union directors Ivan Cardoso and Marcelo Santana (Formiga), which can cause their dismissal. But a fact occurred on the day of the strike further strengthens the severity of these suspensions : at the police station where the happenings during the strike were registered, military police officers had in hand the individual professional file (internal plant documents) of the workers Ivan Cardoso and Marcelo Formiga. It is impossible not to be outraged with the collaboration with the crackdown on workers between the company and the Military Police Corporation. The factory has also dismissed the injured worker Edson Marcondes (violating the legal labor agreement, which guaranteed him employment stability). This worker had always participated in the struggle for labor rights in the plant and he was already a persecution target on the part of Eaton even before this current strike. Eaton’s relationship with Military Police draws the workers’ attention. Every day, police officers eat their lunch, at no cost, at the Eaton’s cafeteria, intended for the plant personnel. This behavior violates the law governing the Military Police of São Paulo State. Besides the police repression and of the psychological harassment against workers, the company has resorted to a judicial measure created during the military dictatorship (prohibitory injunction) to avert the Trade Union’s activities. In the 2014 Salary Campaign, workers and the trade union organization also suffered repression from the company and the Military Police, which was convened by Eaton to force the workers’ entry and prevent any mobilization. During these two years, the company has filed action of Prohibitory Injunction against the Union. It should be emphasized that the injunction is a legal instrument for protection of property and should not be used to forbid the free expression of the workers. The Brazilian Lawyers Association (OAB), a federal entity which represents lawyers in the country, requested the governor of São Paulo, Geraldo Alckmin, the scheduling of a meeting in order to discuss the right to strike of São Paulo workers and the Military Police violent action during the strikes, especially against the metalworkers of Eaton. What does the code of ethics of Eaton say : "(...) We do not tolerate either harassment or discrimination in the workplace"
Psychological harassment is carried out in a wide variety of ways at the plant of Eaton to further increase its profits. One of the ways of psychological harassment is the Wall of Scrap, used to display the name of the workers who produced defective parts. This practice unnecessarily constrains the workers, who feel humiliated. During periods of strikes, harassment happens not only in the workplace. Bosses call the workers in their homes to force them to go to the factory, or they go personally to pick the workers up by car, preventing them from participating of the assemblies and forcing them to act as "strikebreakers". Even the workers’ families are put under pressure. The Labor Court sentenced Eaton behavior and have determined, in case the company returned to harassing the employees in this way, a fine of R$ 100,000 for every act of harassment practiced. "We are threatened every day by the coordinators to increase the production results, we are humiliated with bad jokes and we have to accept. The coordinators go so far as to play the physician role. When a medical certificate is handed in their hands, they contest the medical diagnosis stating that the employee is fully able to work". "The coordinators call every employee at home, obliging them to come earlier to work because the trade union is going to hold an assembly". "The practice of harassment is constant. Employees cry during working hours. After these PLR (Profit Sharing Distribution) negotiations, Eaton says it already has the name of employees who will be dismissed for participating in the strike". What does the code of ethics of Eaton say : "We are committed to being a global leader in safeguarding the health and the safety of our employees and in the environmental protection". The disregard with the health and safety of workers can be easily observed at Eaton, starting with the excessive noise, oil sprawled out at the factory floor and the old machinery. These conditions cause accidents and occupational diseases. There are thousands of labor lawsuits against Eaton in Brazil. For the return of the trade union leaders Marcelo Santana (Formiga) and Ivan Cardoso and the worker Edson Marcondes to the factory. - For the end of the anti-union practices and for the free organization of workers. - For the respect of the right to go on strike. - Against the presence of the Military Police in the workers’ assemblies. We hereby demand the immediate return to work of the metalworkers arbitrarily dismissed by the Direction of Eaton, in São José dos Campos (Brazil), at the peak of their 2015 Wage Campaign demonstrations. 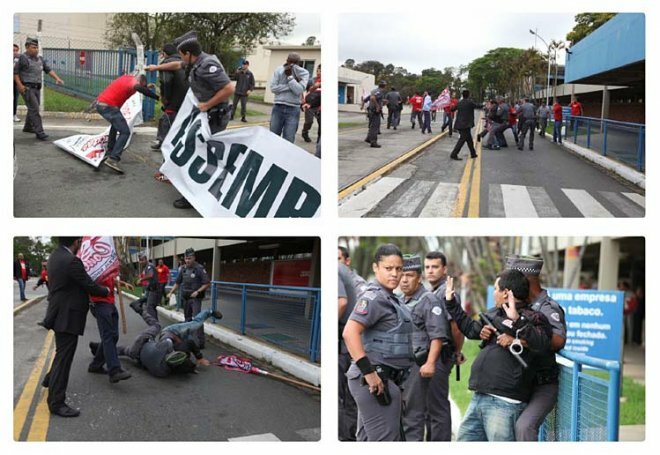 After a strike, held on September 29, which was violently cracked down by the military police led by the Governor Geraldo Alckmin (PSDB), the Eaton Direction held a series of attacks against the workers’ organization, including the "suspension for evaluation of severe transgression" of the directors of the Metalworkers Union of São José dos Campos and Region : Ivan Cardoso and Marcelo Formiga, besides the arbitrary dismissal of the injured worker Edson Marcondes, who enjoys employment stability guaranteed by the category Collective Agreement. There are no doubts that the company truculent attitude aims to demobilize all workers who are struggling for wage increase and labor rights expansion. 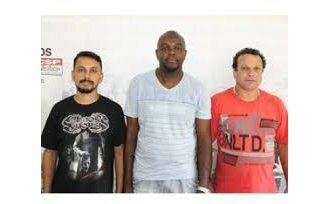 Therefore we demand from the Eaton Direction, in respect to the right to strike, the reversal of its arbitrary measures and the immediate return to work of the comrades Ivan, Marcelo and Edson. Likewise, we demand from the governor Geraldo Alckmin the end of the military police detachments presence at the plants gates to crack down on the workers demonstrations. For the immediate return to work of the metalworkers dismissed by Eaton ! All support to metalworkers of Eaton !